Chart Wealth... Gold Sector Is Shining This Month! November 2005, Volume 2 Issue 11 Know It - Profit! "Gold Sector Shines Through... Mining Stocks Lead The Way"
All that glitters must be gold... the gold sector, that is! With June 2010 gold futures trading near $580, the prospects for mining stocks look golden. The Russell 2000 (^RUT) continues to outperform the other indices. But, in a congestive market it may not mean much. Will it continue to lead the broad markets on the road to nowhere? Or, is a major correction ready to unfold? The PHLX Gold & Silver Sector (^XAU) is shining this month. Who else is making the grade? 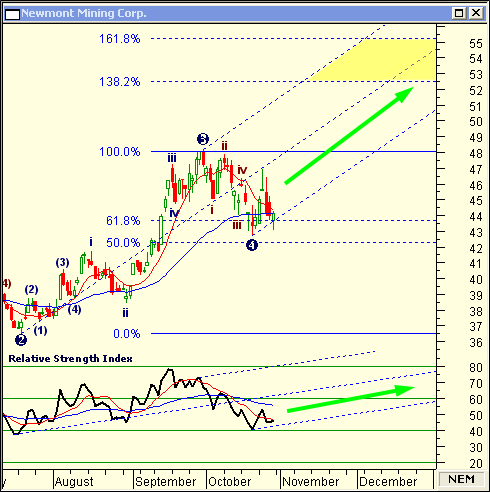 Newmont Mining Corp. (NEM) is making great strides... up 20 percent since July. Will it continue to dig solid gains? First, the completion of the fourth Elliott wave was confirmed after price retraced 50 percent of the third wave. Next, the 138.2 to 161.8 percent Fibonacci extension, which is based on the third wave, forecasts the completion of wave five between $52.50 and $55.25. Also, the projected price channel has NEM reaching its price target window beginning in mid-November. The price channel is derived by applying Andrew-Babson lines which will be covered in future issues of Chart Wealth. Finally, the relative strength index found support at the 40 line and should continue up its projected channel... also, created using the Andrew-Babson lines. In the September issue of Chart Wealth, I called for Halliburton Co. to hit a price target range of $63 to $67. Remember, you need to compare my analysis with yours and determine whether it makes sense and fits with your trading style. My goal is to show you how technical analysis can uncover trading opportunities... with ease and consistency. My intention is NOT to provide you with stock picks!